Watched over by the unblinking eye of the decommissioned Oak Island lighthouse, the sleepy town of Caswell Beach NC has a hidden secret. This quaint seaside town with its rolling dunes covered in sea oats happens to be surrounded by some of the best fishing on the Eastern Seaboard. Luckily for fish crazy anglers Captain Wally Trayah and Captain John Dosher got together years ago to form Oak Island Fishing Charters. Oak Island Fishing Charters makes the most of the waters surrounding Caswell Beach by offering a number of different charter options. 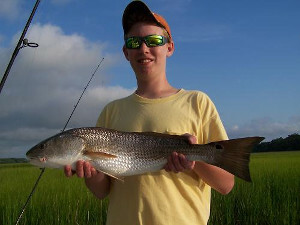 Inshore trips for groups of three or less take guests deep into the creeks and marshes of the Cape Fear River in search of Flounder, Trout, and Red Drum. Full and half day trips are available. The mighty Atlantic tempts anglers on the other side of the island. For those looking to wet a line in the open ocean, Oak Island Fishing Charters offers near shore trips of up to 6 people. The captain targets Spanish Mackerel, King Mackerel, Bluefish, and Shark on these quarter day, half day, and full day trips. Fishermen looking for a full day of hunting big game fish often choose an Offshore trip. Perfect for groups up to 5 people these seven to twelve hour trips venture far out into the open ocean in search of Snapper, Grouper, Mahi-Mahi, and other big game fish. At Oak Island Fishing Charters, we love the waters in and around the Cape Fear River and take pleasure helping our clients experience the excitement of fishing them. Whether you're up for a few hours fishing the creeks or a full day of deep sea fishing, call us today to reserve a charter at 910.470.1995!